The Philips Norelco Shaver 7300 for Sensitive Skin is an electric shaver designed for those with sensitive skin that generally experience irritation after shaving. It was released in 2014 and features an LED screen, five-direction blades and self-cleaning and lubrication. This shaver is designed for those with sensitive skin, if you experience redness, irritation or bumps after shaving, then this shaver might be a good choice for you. It features gentle-precision blades that help to stop tugging, which is a leading cause of irritation when shaving. As the blades move in five different directions, the idea is that they follow the curve of the face which catches hair in hard-to-reach places. You This is definitely not a beginners razor but is instead ideal for someone who has prior experience with electric razors and has the confidence to use something that is more unique compared to a conventional electric razor as this model does take a little bit of time to get used to using it properly. This product is also on the higher-end, price wise. An instruction manual that explains how to use the razor, as well as how to clean the unit. This also details the warranty information. 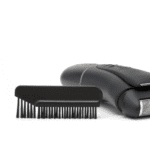 The razor includes a built-in precision trimmer for those areas that require extra care and detail. The included doc is also a cleaning system, which keeps your blades and razor clean and looking like new after each use. The provided cleaning solution is alcohol-free and non-irritating to the skin. During each cleaning, the blades are also lubricated to prevent them from pulling on and irritating the skin. The cleaning system also keeps your razor charged for the next use. The included case is sleek and stylish, allowing it to take up minimal space in your bag. The case is also ventilated to keep your razor dry. A lithium-ion battery and a power cord are also included. When you buy this, you may want to purchase additional blades and foils to keep on hand for when they are required. What Makes This Razor Great? This razor features comfort rings, as it’s designed to minimize pulling and tugging on the skin of the face and neck area. The unique micro beading technology incorporated in this shaver reduces friction by up to 85%. This razor features an LED display that shows you the battery life, the blades-life expectancy and also displays the travel-lock feature, which prevents the razor from turning on when traveling. This shaver moves in five different directions, which grab the hairs and cut them off quicker and easier than conventional shavers. It hugs the curves of the face and neck which in turn catches hair quicker in hard-to-reach areas. You can use this shaver either wet or dry. Save time by shaving in the shower without the need to add additional lubricant to the skin. The included smart-cleaning system keeps your shaver fresh and clean after each use. Simply submerge the razor in the provided cleaning tray and it does the rest. The alcohol-free cleanser and lubrication helps to reduce friction with the skin and provide a clean-comfortable shave. Pros:1. 5 Direction Blades to catch hairs the first time around, leading to less friction on each shave.2. The cleaning system that keeps the razor fresh and clean after each use.3. Wet and Dry use to help save time and shave in the shower.4. A ventilated case for easy carrying that helps prevents rust and mildew. 5. Actively prevents razor burn with the 5-way shaving technology. Cons:1. Price, this shaver is one of the more expensive ones on the market.2. Can be tricky to use, especially for inexperienced shavers.3. Doesn’t glide well and can tug on the skin.4. Separate trimmer means another item to carry around.5. Can take multiple tries for a close shave. Overall, this is a great shaver if you suffer from sensitive skin. The technology embedded in the shaver helps to reduce friction against the skin, which is one of the leading causes of irritation. The self-cleaning helps to ensure a fresh, clean shave at every use. Being able to use this razor either wet or dry is a handy feature and definitely a time-saver. While it may take some getting used to, once you sort out how to use this razor, it works very well. The price-point is a little bit on the high side and there are similar razors out there that cost a bit less, but you are getting added value with the added cleaning port.